After 4 episodes of ‪Daredevil‬ on ‎Netflix‬, they are really getting it right, with a show much better — and more solid — than I think we had a right to expect. I love that they film in New York rather than using stand-ins, with Vincent D’Onfrio as Wilson Fisk, Rosario Dawson as nurse Claire and Vondie Curtis-Hall as reporter Ben Urich as standouts. I also appreciate a lot of the shadowy lighting, which gives the tone of the show a realism that often is lacking in genre TV. And I thought they did a really nice job with the back story of Battlin’ Jack Murdock, which is so important to Matt Murdock/Daredevil’s motivations. If there’s a weakness in the show, for me it’s actually Charlie Cox as Daredevil himself. He’s not bad. Don’t get me wrong. It’s a tough role to play. But it’s obvious that he’s struggling w the American accent, forcing himself to ‘sound’ American, with a lot of the charisma he showed in Boardwalk Empire somewhat lacking here. Brit Charlie Hunnam said he had the same issue during the first season of Sons of Anarchy, focusing so hard on making his facial muscles contort to the sound of the American dialect that he found his breathing restricted, which thus made him more rigid than he wanted. But once he got the hang of it, he got much loser, and it showed in his performance throughout the rest of the series. So maybe the same will happen for Charlie Cox. I also find Elden Henson working just a little too hard as Foggy Nelson. If he would ease up even just a little bit, it would go a long way. In any case, there’s really just so much to like here I can’t wait to see what comes next. 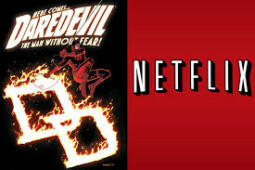 Daredevil is off to a great start. The fine folks at The Writer’s Life eMagazine did a Q&A with yours truly about my new book Genius de Milo, and my thoughts on the life of a writer. If you want to take a peak at what’s squirreling around inside my brain … here goes! Q: Welcome to The Writer’s Life! Now that your book has been published, we’d love to find out more about the process. Can we begin by having you take us at the beginning? Where did you come up with the idea to write your book? Russ: My debut novel Finders Keepers is a scifi backpacking comedy … think American Pie meetsHitchhiker’s Guide to the Galaxy. It’s loosely based on a series of backpacking trips I took through Europe and New Zealand, set against a quest for a jar that contains the Universe’s DNA. 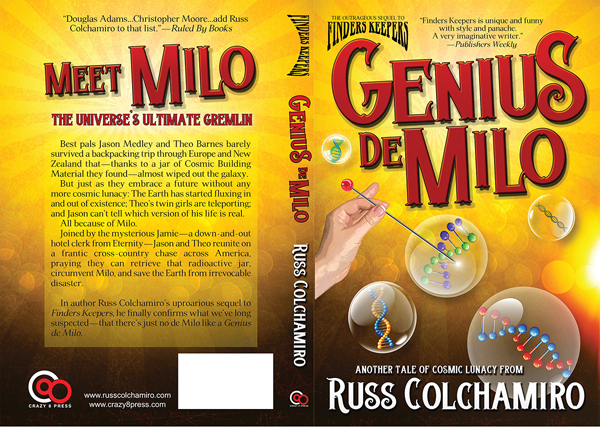 Genius de Milo is the second book in the trilogy, where our bumbling backpacking heroes Jason Medley and Theo Barnes are once again tasked with retrieving a radioactive jar filled with the Universe’s DNA … before it wipes out the galaxy. Cover Reveal!! 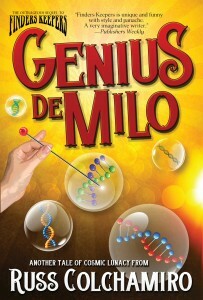 Genius de Milo! At long last, here is the absolutely awesome new cover for GENIUS DE MILO, the sequel to my scifi backpacking comedy FINDERS KEEPERS. Huge thanks to my pal Roy Mauritsen who brought it to life! Look for updates soon about the official book launch!! There’s a strange feeling that comes with almost being done with a novel. I’m having that sensation now. The sequel to Finders Keepers — Genius de Milo — is just about done. The manuscript is written. I printed it out, doubled spaced, and have been reading the pages for the last few weeks. I’ve read every word on every page, twice, and I’m down to the last 20 pages on the third and final read-through. Some pages are perfectly clean, others have lots of hand-written notes, and the rest are somewhere in between. In addition, the Genius de Milo manuscript is in the hands of three trusted friends who I’ve worked with before, who will be sending back their notes within the next month. There’s an excitement to being almost finished. A flutter of anticipation. There’s also a sense of … ooooh, this book is going to be great, but I’m basically done, so … let’s ease up. And there’s even a middling sense of … I want to be done already. I’ve been at this a long time. I’m ready to move on. But mostly … I’m feeling good. Yes, the fatigue can set in, but this time around I’m coming to the finish line with energy, focus, and enthusiasm. I’ll be done reading pages within a day or so. Then I need to get back to the computer, and start transferring all of my hand-written notes to the electronic file. In most cases we’re talking minor technical edits — a spelling mistake, a misplaced comma, the wrong character name! But there are cases where a sentence or paragraphs needs to be re-written, and one section I’m going to cut entirely because it doesn’t serve the story. There’s some character development that I liked, but not enough to warrant slowing down the plot. So that’s gone. I’ll have to fill in some details through Web searches, and fact check a few items. I figure it’ll take me 2-3 weeks to input all of my changes, by which time I should be getting notes from my reader crew. What comes next will depend on their notes. They might have minor notes, or perhaps they’ll be more extensive. And then I’ll have to think on them, and decide which ones to incorporate into what by then should be a ‘clean’ manuscript. This is the time to really focus. To appreciate that being almost done isn’t the same as being actually done. It’s those final edits, those little tweaks that can clean up a mistake, take a passage from good to great, and even elevate the tenor of the entire novel. The finishing touches are vital. At least that’s been the case for me. Yet getting those final touches across with nuance and sophistication, while fighting off the fatigue of just wanting to be done, is critical. It’s where the mental discipline comes in. The focus. So here I go, ready to finish another novel, one that I’m awfully excited about. Genius de Milo has been a lot of fun to write. I’m curious as to what you all will think. Hopefully you’ll enjoy it. Now it’s a matter from getting this book from almost done to actually done. This weekend — Friday, August 1 – 3 — I’ll be down in Hunt Valley, MD for Shore Leave, a fan-run science fiction that is loads of fun — with Spock himself Leonard Nimoy as one of the big name guests. 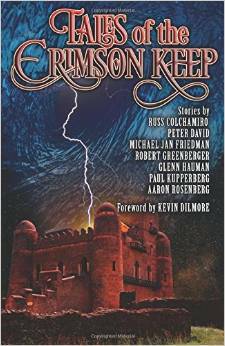 I’ll also be there with my Crazy 8 Press partners in crime, and where we’re debuting our new fantasy anthology, Tales of the Crimson Keep. I’ll be there meeting fans, signing books, and turns out I’ll be talking on a LOT of panels. My latest novel, Crossline, is a scifi adventure about two men — a civilian space pilot forced through a wormhole and into a war-torn parallel Earth, and the CEO of the corporation who launched the pilot to begin with — and how their journeys intersect. But underneath the scifi elements lies a more personal story– a trilogy, in fact — that I wrote in high school. It was my first real attempt at fiction, and, all things considered, it wasn’t half bad. It was based on the ‘troubles’ in Ireland, which, of course, I knew absolutely nothing about, but when you’re trying to impress a girl, well … you make stuff up and hope for the best. The girl, in question, did like the stories, and she was impressed. But not so much that things went the way I wanted. Or, I should say, I lost parts two and three. I wrote those stories by hand, and then typed them up, because this was back in the mid 1980s, before everything we did was on computers and saved on a hard drive. And, because, I was a putz. I don’t remember if passed the printed pages onto to someone or I simply left them lying around somewhere, but I didn’t have the mental wattage to make copies or keep track of them. I still have the original — with the truly awful title Skies of Green — but the others are long gone. For several years after that I tried to recreate them, to expand on that trilogy, but that original magic, even back then, was lost to me. The core story stuck with me — I always felt I had something there — but I was never able to recapture the nuance, and improve upon it. To write a new version. So they drifted into the ether for the better part of 20 years. And then … I had the inspiration for Crossline — the scifi part of it anyway — and suddenly my original story had a new life. Bringing that story full circle gave me real satisfaction, and a sense of closure. Yet as pleased as I am with how Crossline turned out, and the excellent response I’ve been getting to it … those original missing pages are still out there somewhere. And like the girl I was trying to impress, in some ways, those pages – and the words they contained — are the ones that got away. You wanted to know more about us, but you know what they say … be careful for what you wish for. You might surely get it! 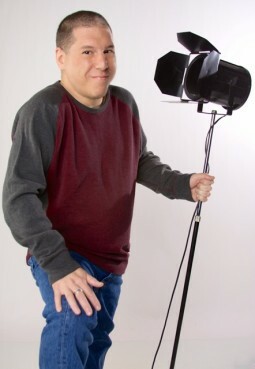 What that warning in mind, here are 8 Things you Need to Know About Crazy 8 Press Author Russ Colchamiro (but might have been afraid to ask, or might be traumatized by, now that you know them). 1- Russ’ first work of fiction came in the 3rd grade. It was a King Arthur-esque action/mystery tale, with the evil King Quenpor. Wow. Was it bad. 2- During his student teaching tenure in Buffalo, NY, Russ taught five classes a day, all 11th grade English. He didn’t meet two of his students because they were out — on maternity leave — each for their second child. 3- A one-time Wiffle ball aficionado, one summer afternoon, in front of his house in Merrick, NY, on Long Island, Russ was on the mound. Pitching, he chucked a pretty good slider, which his buddy smacked over his head. Russ dashed after the batted ball, across the street, head craned in the air. He leapt, to make an incredible basket catch, Willie Mays-style, but his foot hit the curb, hard. When he came down, Russ landed on his wrist, to brace himself. He wound up badly spraining his left wrist, which required a splint, and broke the big toe on his right foot, putting him on the DL for 6 weeks. The first recorded injury in Wiffle Ball history. 4- The characters of Jason Medley and Theo Barnes, from Russ’ hilarious Finders Keepers trilogy, are indeed based upon Russ and his friend, a native New Zealander. Russ does warn readers, however, that all of the European and New Zealand backpacking scenes, are, in fact, fictional, no matter how authentic they might appear. But all of the scifi, galactic, time-bending elements are totally real, based on true events. 5- During one crazy night in Brooklyn he will never forget, Russ did place his lips on those of a dead girl. A very. Dead. Girl. But that’s a story for another day, which he promises he will tell … once the therapy sessions enable him to recall the event without sending him back to the loony bin. 6- In his rousing scifi adventure novel, Crossline, Russ penned a truly hilarious scene involving Gefilte Fish. But he had to cut the scene to keep the action moving along. He’s trying to find a way to bring the scene back in follow-up Crossline adventures, but can’t promise because he can’t stand the smell or taste of Gefilte Fish, no matter how many Seders he attends. 7- During Russ’ trip overseas, many moons ago, that inspired his debut novel Finders Keepers, his cat, Alex, was hit by a car. Alex was terribly injured, but ultimately made a full recovery. About 15 years later, while Russ was at the NY Comic Con debuting Finders Keepers, his dog, Simon, was hit by a car, terribly injured. He, too, made a full recovery. We don’t know what’s up with that book, it’s got some crazy mojo attached to it. Which is particularly odd, considering that, fundamentally, Finders Keepers is about enjoying life to its fullest, as often as you can, as thoroughly as you can, for as long as you can. 8- In both Finders Keepers and Crossline, some of Russ’ characters profess their love and loyalty for one another, themes that are particularly important to him, even within the context of his wild, scifi adventures. In all cases, Russ says those scenes are really love letters to his wife, Liz. Even after 14 years together, Liz is more than Russ’ wife; she’s his girl.